Notre Dame has announced the launch of the Latino Studies Scholars Program (LSSP), a merit-based scholarship and accompanying curriculum for undergraduate students designed to attract and shape leaders working to support and empower Latino communities. The scholarship was created by the University’s Institute for Latino Studies (ILS) as part of its mission to advance the understanding of the fastest growing and youngest population in the United States and the Catholic Church. ILS strengthens the Notre Dame mission to prepare transformative leaders in education, the professions, the arts, economic and civic participation, faith, and family life among Latinos and all members of our society. Scholars are awarded $25,000 per year for four years of undergraduate study at Notre Dame, along with up to $5,000 per summer for three summers to fund enrichment activities such as internships, conferences, and study abroad. Notre Dame seeks to attract the best and brightest students with an interest in impacting the Latino community. 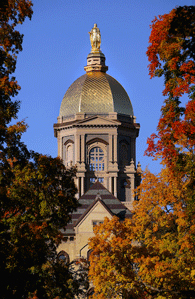 Both students of Latino and non-Latino origin are eligible, and once selected, students may enroll in any college or major at Notre Dame. The most significant qualification will be a student’s demonstrated interest in and commitment to the future of Latino communities in the United States. Candidates will also show an interest in Latino Studies at Notre Dame. Overseen by the Institute for Latino Studies, in partnership with the Enrollment Division, the program will provide a curriculum, internships, and research opportunities to engage the cohort of scholars in Latino Studies. As a leading Catholic research institution, Notre Dame recognizes the importance of the growing Latino community in the United States and its impact on the future of the country and the Catholic Church.“Leaders in education, the professions, the arts, the Church, business, and politics cannot be successful if they lack core knowledge about Latinos, the fastest-growing and youngest population in the United States. The Latino Studies Scholars Program is at the heart of efforts at the Institute for Latino Studies and Notre Dame to equip our students with the training they need to be transformative leaders in the Catholic Church and society,” says Timothy Matovina, co-director of the ILS and professor of theology. “It is often said that leaders are not made; they are born. We are convinced that whatever the origin of leaders, they must be supported to develop to the full range of their abilities. LSSP is designed to help the next generation of leaders reach that potential as a fundamental part of their undergraduate studies.”“Through the Latino Studies Scholars Program, Notre Dame is demonstrating its commitment to develop the next generation of leaders who are committed to expand the common good,” says Luis Ricardo Fraga, co-director of the ILS, Notre Dame Professor of Transformative Latino Leadership, and Joseph and Elizabeth Robbie Professor of Political Science. “One cannot be such a leader in any sector without a deep understanding of Latino communities, the largest ethnoracial group in the country and in the Catholic Church. Originally published by Shannon Rooney at al.nd.edu on October 04, 2016.